The number of subscribers who pay to use the Telegraph’s iPad app are “hugely encouraging”, said Tim Rowell, director of mobile development at the Telegraph Media Group. The app has received a boost as there are more over 55s with iPads than under 35s, Rowell explained, “which is a sweet spot for us as they are our readers”. Research shows the average age of the Telegraph iPad reader is 47, about half way between average age of print and web reader. Speaking at the Media Briefing’s Mobile Media Strategies event today, Rowell refused to go further and reveal how many people had signed up since the launch of the subscriber app on 5 May. The Telegraph’s paid for app launched just over a month ago with readers paying £1.19 a day (which is 19 pence more than the print edition due to the limited rates set by Apple) or £9.99 a month. The Telegraph’s 340,000 print subscribers are able to access the content via the app without paying extra. The fact readers are willing to pay is “incredibly reassuring”, Rowell explained, as feedback before the launch of the subscriber app suggested the reverse. The research was carried out by “rushing out” a free iPad app and gathering audience data. Approximately 60,000 people agreed to have their browsing information analysed. The inclusion of web trends showed what people were reading, when and whether they were using 3G or a wifi network. The free app research showed weekend reading was twice as popular as week-day reading on the app, with two daily peaks, at 7am and 9pm. As the app was updated just once a day readers were accessing content that was almost 12 hours old. “But that was not important”, Rowell said. In edition to wider audience data, around 1,800 people submitted a feedback form to give the Telegraph an even more detailed picture of what readers wanted, which included the crossword. The biggest surprise in the research findings was the worldwide spread of iPad Telegraph readers, Rowell said. Another key lesson is that the app is “not a substitution for print”, Rowell said, and it requires spend. The annual running costs of an app are around six times the cost of building the iPad app. This entry was posted in Events, Mobile, Online Journalism and tagged #mobilemedia11, iPad app, telegraph, Telegraph Media Group, Tim Rowell on June 14, 2011 by Sarah Marshall. 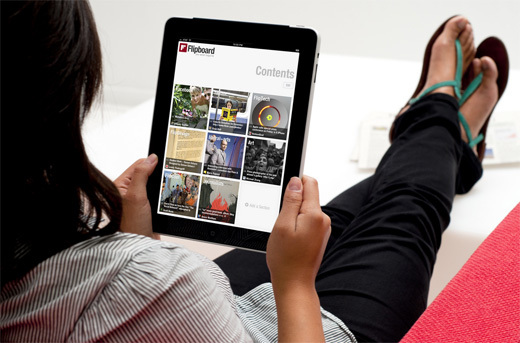 Flipboard, a “social magazine” for the iPad that pulls in content from the web, has announced partnerships with the Guardian and the Telegraph. Announcements from the company about the Guardian – “the central liberal voice in the British media” – and the Telegraph – “one of the most circulated broadsheets in the UK” – have been timed to coincide with the upcoming royal nuptials. We’re launching the Guardian and the Telegraph at this precise moment so you can feel like you’re right there in Westminster Abbey witnessing the union and following events from the eyes of Londoners. The US app has also added OK Magazine and Brides Magazine in advance of the wedding. Flipboard was launched in July last year to offer its users a magazine-like collection of news, features, videos and images circulating within their social networks. In December it announced that eight US news outlets including ABC News and the Washington Post Magazine were testing the app as a distribution platform. Last week the company announced additional investment of $50 million (£30 million), taking its value to around $200 million (£121 million). According to the company the funds will be used to expand its staff from 32 to around 50. It also announced a partnership with Oprah Winfrey’s media network. This entry was posted in Handy tools and technology, Magazines, Social media and blogging and tagged apps, Flipboard, iPad, iPad app, social media, social sharing on April 26, 2011 by Joel Gunter. The Financial Times has launched its FTChinese.com app for iPad. The app is compatible with both the wi-fi and 3G iPad models and allows readers to download content to browse offline. It is sponsored by watchmaker Rolex. The launch follows the FT’s highly successful iPad app, launched in May, which has attracted around 400,000 downloads and generated more than £1 million in advertising revenue. According to global commercial director Ben Hughes, the iPad now accounts for 10 per cent of the paper’s new digital subscriptions. This entry was posted in Handy tools and technology, Mobile, Newspapers and tagged apps, Financial Times, ftchinese, iPad, iPad app on October 14, 2010 by Adam Levitt. Wikipedia will soon be available on the iPad with the launch of new app, ‘Discover’, according to a report by cnet.com. Discover is the first app from software company Cooliris, which already produces an iPhone app that enables its users to turn photo collections into “interactive 3D wall” art. The new app uses content from Wikipedia and organises the data into sections which can be browsed in a magazine format instead of having to scroll down a long browser window. The end result is a Wikipedia with larger text that can be read like an e-book and photos that can be thumbed through and scaled up to the iPad’s full resolution. The app also takes advantage of orientation to reposition, expand or consolidate the data it’s showing. Along the way, Cooliris serves up advertisements, which is where it can make some of its money given the app’s free price tag. Discover has been submitted to the App Store and users are invited to sign up here to be notified of its availability. This entry was posted in Editors' pick, Magazines and tagged CNET, Cooliris, iPad app, Magazines, Wikipedia on July 27, 2010 by Rachel Bartlett. The Sydney Morning Herald in Australia has been criticised after an announcing that local users would have to subscribe to the print edition in order to access the Herald’s new iPad app. The SmartEdition app is advertised by the paper as enabling users to “read the Herald exactly as it appears in print, but on digital devices”. It’s ideal for when you are away from home and crave local news in the newspaper format, with the convenience of digital access. Australian users can subscribe to a 7-day free trial if you download before August 31, 2010 if you are not a Herald subscriber. To access THE SMH app after downloading, tap the subscribe button within the app and follow the prompts. Readers that live outside Australia can access a 7-day, 52-week subscription to The Sydney Morning Herald SmartEdition for just AU$52 a year. According to mUmbrella this means “if you’re in New South Wales or ACT, the only way you can get hold of the iPad app is to subscribe to the print edition”. It’s about using the iPad app as a way of shoring up plummeting print circulations. This is all about Fairfax being able to present its iPad subscribers to the Audit Bureau of Circulations as full price print subscribers who happen to be getting a “complimentary” copy of the app. Techdirt added to the criticisms, saying this revenue stream will prove to be a “short-sighted” move by the publishers. It’s no secret that some publications view the iPad and paywalls as ways to slow down the rate at which people are ditching subscriptions to paper publications — but it seems particularly short-sighted to make that the only way to get access to the digital app. This entry was posted in Editors' pick, Newspapers, Online Journalism and tagged iPad app, mUmBRELLA, Sydney Morning Herald on July 27, 2010 by Rachel Bartlett. Flipboard, the world’s first personalised social magazine, has been launched on the iPad, offering its users a magazine packaged collection of the news, features, videos and images circulating within their social networks. The app was masterminded by Mike McCue, former CEO of Tellme and Evan Doll, former senior iPhone engineer at Apple and is getting its first public demonstration later today. Because Flipboard renders links and images right in the magazine, readers no longer have to scan long lists of posts and click on link after link – instead they instantly see all the stories, comments and images, making it faster and more entertaining to discover, view and share social content. Flipboard also lets readers easily create sections around topics or people they care about. Choose from Flipboardʼs suggested sections on topics such as sports, news, tech and style, with content hand-curated from popular and interesting Twitter feeds. Or, create an entirely new section by searching by topic, person or Twitter list to make Flipboard even more personal. This entry was posted in Editors' pick, Handy tools and technology, Magazines and tagged Flipboard, iPad app, Magazines, social networks on July 21, 2010 by Rachel Bartlett. Tracey Boyer looks at Touching Stories, an application developed for the iPad by two US, interactive design studios, which has been used to create a series of documentary films. This entry was posted in Editors' pick and tagged interactive storytelling, interactivity, iPad, iPad app, multimedia, touching stories on July 19, 2010 by Laura Oliver. National commuter favourite The Metro has launched an iPad app, offering readers bitesize news, sports and showbiz. The newspaper already has an iPhone app available, launched earlier this year. [advert]The Metro joins other national newspapers, including the Financial Times and Express Newspapers, who have launched iPad apps this year. In a release, Metro says it was created “with a newspaper in mind, offering digital news in a paper-like experience”. “It gives readers the chance to swipe between individual headlines and full stories with a single finger, whilst moving between the different sections, including News, Showbiz, Sport, Weird, Music, Film, TV and Tech, using a dual finger swipe,” they say. The Metro worked with digital design agency Fjord and mobile agency Bluestar, to create the app. This entry was posted in Newspapers, Online Journalism and tagged apple ipad, iPad, iPad app, iPad application, Metro on July 7, 2010 by Rachel Bartlett.